The effects of exogenously applied H2O2 on growth, water status, the mineral ion content (Na+, K+, Ca2+, Mg2+ and Cu2+), proline, total sugars and soluble proteins were assessed in leaves of maize (Zea mays L.) cultivars, Akpinar and Pegaso exposed to excess copper (0.5 mM). Seedlings were grown in equal-sizes plastic pots and irrigated with Hoagland nutrient solution containing H2O2 or/and copper. Different treatments taken for pot experiments were named as the control (C), H2O2 treatment only (H2O2), excess Cu (Cu) and, Cu stress combined with H2O2 pretreatment (Cu + H2O2). Treatment of H2O2 caused the increases in growth, water content, mineral concentration, proline, total sugar and soluble protein contents compared to the control groups in the leaves of both cultivars. Yet excess copper caused reductions in the growth, leaf water potential, Na+, K+, Ca+, Mg2+ concentrations and soluble protein levels but increases in proline, total soluble sugars and Cu2+ contents compared to the control group. Dry matter, leaf water potential and mineral content of Cu + H2O2 group revealed a lower decrease than Cu group ones. A higher increase was also observed in proline and total sugar contents of Cu + H2O2 group than Cu group ones in both cultivars. These data revealed that exogenous H2O2 might increase the dry matter production and the mineral ion distribution in maize seedlings. Moreover, osmotic regulation might be involved in alleviation of copper toxicity of maize leaves by pretreatment of H2O2. Modern human activities like mining, smelting, municipal waste disposal and electroplating are the important sources of heavy metal pollution in the environment. Among the heavy metals, copper (Cu2+) is considered to be one of the most important pollutants of the air and is also very significant pollutant of agricultural soils (Alloway, 1990). Soils may contain elevated levels of Cu because of its widespread use as a pesticide, land application of sewage sludge as well as mining and smelting activities. However, Cu is essential micronutrient for normal plant metabolism and involved in a number of physiological processes such as photosynthesis, respiration, carbohydrate distribution and protein metabolism. On the other hand, even metabolic metals beyond a threshold concentration are harmful to biological systems (Foy et al., 1978). For instance, excess Cu might decrease the leaf water content, shoot elongation, plant biomass and germination rate (Ahsan et al., 2007). Modulation of water content, biomass and osmotic solutes in plants after exposure to copper was frequently reported in the literature (e.g., 2001). Important among a variety of compatible osmolytes in higher plants were soluble sugars, organic acids, proline, soluble proteins (Ashraf, 2004) and inorganic minerals such as sodium, potassium, calcium and chlorine (Chen and Jiang, 2010). Sucrose content, one of soluble sugars increased in the cucumber leaves by copper stress and the uptake and the upward translocation of the ions were altered (Alaoui-Sosse et al., 2004). Similarly, proline content increased in plants when exposed to wide variety of environmental stresses and thus provided the plants protection against damage by reactive oxygen species (Aspinall and Paleg, 1981). For instance, excess copper induced accumulation of proline in various plants such as Oryza sativa (Chen et al., 2001) and Nicotiana benthamiana (Ku et al., 2012). Adversely, it has been shown a decrease in soluble protein level at several stress condition like copper and aluminum stresses (Yadav et al., 2009). Namely, both organic and inorganic solutes are essential for osmoregulation in plants, especially stress conditions. However, their relative contribution to osmotic adjustment varies from plant to plant or species to species, or even within different tissue of same plant (Ashraf, 2004). On the other hand, it has been well known that H2O2 is a major kind of reactive oxygen species in plant tissues. However, increasing lines of evidence supported the idea that H2O2 might act as a signal molecule with multiple functions in plants. Numerous studies have shown that the application of H2O2 at low concentrations could improve plant tolerance to heat stress (Gao et al., 2010), salt stress (De Azevedo Neto et al., 2005; Li et al. 2011), aluminum-induced oxidative stress (Xu et al., 2011) and heavy metal stress (Lin et al. 2004; Hu et al., 2009). The increased metal stress tolerance was attributed to induced antioxidant defense system after pretreatment with H2O2 in rice seedlings (Hu et al., 2009). Despite a large number of reports detailing plant tolerance mechanisms to heavy metals, plant responses to H2O2 pretreatment under heavy metal toxicity are not properly understood. It is known that crop plants, such as maize, wheat and barley may be subjected to heavy metal stress during their growing period. The accumulation of heavy metals in the seeds and other above ground parts of maize has been becoming a serious problem for agriculture and human health. Maize (Zea mays L.) is an important staple C4 food crop in many countries of the world and it accounts for around 712 million metric tones in 2006. Early studies showed that excess copper reduced plant biomass and cell increment of many plant species (Ouzounidou et al., 1998). As mentioned, application of H2O2 at low concentrations could induce stress tolerance in plants. However, the effect of H2O2 pretreatment to Cu toxicity is far from unclear. The objective of this study was to determine the response of H2O2 pretreatment to high copper content in two maize cultivars, Akpinar and Pegaso differently sensitive to water deficit. The biomass accumulation, alterations in water status, mineral ion content (Na+, K+, Ca2+ Mg2+ and Cu2+), soluble protein, proline and total soluble sugars were investigated in the leaves of two maize cultivars pretreated with H2O2 under Cu stress. Two Zea mays L. cultivars differently sensitive to water deficit (cv. Pegaso more tolerant than Akpinar cv.) were provided from Black Sea Agricultural Research Institute, Eskisehir, Turkey and Limagrain Seed Production Company, Istanbul, Turkey. Seeds were surface sterilized with 0.1% HgCl2 for 3 min followed by repeated washings with sterilized distilled water. Seeds were sown in pots (14 cm height, 16 cm top and 11 cm bottom diameter) containing sterilize water washed sand. Seedlings were grown in a growth chamber with the following parameters: 16 h light and 8 h darkness at 25°C ± 2, relative humidity 60% ± 5, photon flux density of at the surface of the leaves 400 μmol m-2 s-1 and were watered once per two days with Hoagland nutrient solution (pH 6.0). When the second leaves were fully expanded, the pots were divided into four groups for each maize cultivar. Two groups were watered with Hoagland nutrient solution, and the other two groups were watered with freshly prepared Hoagland nutrient solution containing 0.5 mM H2O2. The H2O2-applied plants were watered with either the Hoagland nutrient solution only or Hoagland nutrient solution containing 0.5 mM CuSO4 for additional five days and were designated as “H2O2 treatment (H2O2)”, and “Cu + H2O2 pretreatment (Cu + H2O2)”, respectively. The other two groups of the pots were separately watered with either of the two types of nutrient solutions and were named “control (C),” and Cu stress (Cu)”. After two days of the treatments, samples of the third leaf were used for the following analyses. Leaf samples were extensively washed with distilled water and then the samples were oven-dried and ground to power. The powder was ashen in a muffle furnace at 550°C for 4 h and the residue was brought to a standard volume with 1 M HNO3. Cu concentration of the extract was determined by a flame atomic absorbption spectrophotometer (Unicam, 929 AAS). The copper content of tissues was expressed as μg/g dry weight. To determine endogenic H2O2 content after exogenous applications, hydrogen peroxide content was determined according to modified method of Velikova et al. (2000). Leaves (0.25 g) were ground in 3 ml of 5% trichloroacetic acid with 0.1 g activated charcoal at 0°C. To 0.5 ml aliquot of the supernatant, 0.5 ml of 10 mM potassium phosphate buffer (pH 7.0) and 0.75 ml of 1 M KI were added. The absorbance was measured at 390 nm and H2O2 content was expressed as μmol g-1 fresh weight. To obtain enough data on variations in the growth of the plants, the measurement of dry weight, and the grade of growth inhibition (GGI) were recorded. To measure dry weight, the plants were harvested from four group pots and fresh weights of the leaves were determined. Then the samples were oven-dried at 80°C for 24 hours (Jiang et al., 2004, 1993. All treatments were compared to the control group (control GGI = 0, i.e., 100% growth). Leaf water potential (Ψleaf) was measured with a C52 thermocouple psychrometer (Wescor, Inc., Logan, UT, USA). Discs about 6 mm in diameter were cut from leaves and sealed in a C-52 psychrometer chamber. The readings were recorded by a Wescor PSYPRO water potential data logger in the psychrometric mode after samples were equilibrated for 45 min. Values of leaf water potential were measured as MPa. where FW, DW, and TW are fresh weight, dry weight, and turgid weight, respectively. Proline content was achieved according to the method Bates et al. (1973), and dried ground leaves (0.25 g) were used for proline extraction. Samples were homogenized in 5 ml 3% sulfosalicylic acid and extracts were centrifuged at 8000 x g for 15 min. 1 ml filtrate was mixed with equal volumes of acetic acid and ninhydrin reagent (1.25 g ninhydrin, 30 ml of glacial acetic acid, 20 ml 6 M H3PO4) and incubated for 1 h at 100°C. The reaction was stopped by placing the test tubes in ice cold water. The samples were rigorously mixed with 3 ml toluene. After 50 min, the light absorption of the toluene phase was estimated at 520 nm on a UV-VIS spectrophotometer. The proline concentration was determined using a standard curve. Free proline content was expressed as μg/g dry weight. For extraction of soluble proteins, the leaf samples were freshly harvested and fixed in liquid nitrogen. Thawed leaves were homogenized in 0.05 M sodium phosphate buffer (pH 6.0) with 0.1% polyvinylpolypyrrolidone (PVPP). The homogenate was filtered through cheesecloth. The filtered homogenate was centrifuged at 20000 x g for 20 min at 4°C. After centrifugation, the supernatant was taken and used for protein measurements. Soluble protein content was assayed according to Bradford (1976). Absorbance was read on a UV-VIS spectrophotometer at 595 nm. The soluble protein concentration was determined by using bovine serum protein (BSA, Sigma, USA) as a standard and expressed as mg/g fresh weight. Total soluble sugar content was determined by phenol-sulfiric acid method (Dubois et al., 1956). Dry leaves (0.1 g) were extracted with 5 ml of 80% ethanol, by boiling the samples in glass tubes in a 95°C-water bath for 10 min. After extraction, the tubes were centrifuged at 489 x g for 5 min, and the supernatants of the extractions were used for sugar analysis. One hundred ml of sample was added to 900 ml of distilled water then mixture was vortexed. One ml of 5% phenol and 5 ml of H2SO4 were added to 1 ml of sample and the mixture was stirred. After cooling under room temperature for 15 min, absorbance of sample was recorded at 490 nm. Total ion content (Na+, Ca2+, K+ and Mg2+) was measured with a pH/mV/Ion/Temp meter (JENCO 6251 N). The leaf samples (0.5 g) were homogenized with liquid nitrogen in 5 ml deionized water. The homogenate was boiled in a water bath for 10 min. The precipitate was removed by centrifugation. Analysis of variance (ANOVA) of means of 6 replicates for leaf water potential, RWC, dry weight, amounts of inorganic ions, proline, protein and total soluble sugar contents was performed with Duncan Multiple Comparison test using SPSS for Microsoft Windows (Ver. 10.0, SPSS Inc., USA) and statistical significance between the two cultivars along with different treatments was determined at P < 0.05 level. Copper concentrations were determined in the leaves of the test plants and shown in Figure 1. The plants that grown under 0.5 mM Cu revealed high Cu concentration. Exogenous H2O2 applications (H2O2 group and Cu + H2O2 group) also caused the increases in the copper content of the leaves of both cultivars. However, the increases in Akpinar cv. were higher than Pegaso cv. ones in both H2O2 group and Cu + H2O2 group. For instance, in Pegaso cv., Cu concentrations were measured as 26 ± 3, and 29 ± 0.4 μg g-1 dry weight in the control and H2O2-treated group, respectively. Under excess Cu applications, Cu concentrations were recorded as 45 ± 0.3 and 49 ± 0.4 μg g-1 dry weight in the copper exposed plants and copper stress plus H2O2 pretreated plants, respectively. As for Akpinar cv., Cu concentrations were found as 27 ± 2, and 32 ± 2 μg g-1 dry weight in the control and H2O2-treated group, respectively. Also, under excess Cu applications, the concentrations were recorded as 39 ± 2 and 51 ± 2 μg g-1 dry weight in the Cu group and Cu + H2O2 group, respectively (Figure 1). The effect of H 2 O 2 application on Cu concentration under excess copper in maize cultivars. The plants were submitted to four treatments: control (C); H2O2 treatment (H2O2); Cu stressed (Cu); Cu stressed plus H2O2 pretreatment (Cu + H2O2). Vertical bars represent standard deviation. Different letters denote significant differences between the two cultivars along with different treatments at p < 0.05. Endogenic H2O2 content after exogenous applications increased in two cultivars. Also, the H2O2 concentration significantly increased under excess copper. Pretreatment with H2O2 also reduced the overproduction of H2O2 in both cultivars under copper stress (Figure 2). The effect of H 2 O 2 application on H 2 O 2 content under excess copper in maize cultivars. Vertical bars represent standard deviation. Different letters denote significant differences between the two cultivars along with different treatments at p < 0.05. Toxicity of copper and the effect of H2O2 application on the growth of maize cultivars, Akpinar and Pegaso are presented in Figure 3. To understand how H2O2 induced tolerance to copper stress, we studied the changes in dry matter and mineral ion content, and osmoregulation mechanism of the leaves of two maize cultivars. While maize cultivars exposure to excess Cu showed a significant decrease in dry matter, dry weights of H2O2-treated plants revealed a significant increase. H2O2 pretreatment also reduced the decrease in amount of dry matter in both cultivars (Figure 3 A). The effect of H 2 O 2 application on dry weight and GGI (%) under excess copper in maize cultivars. A and B represent dry weight and GGI (%), respectively. Vertical bars represent standard deviation. Different letters denote significant differences between the two cultivars along with different treatments at p < 0.05. A protocol used for phytotoxicity testing, the grade of growth inhibition (%) was also evaluated in this study and a significant GGI (%) was observed in plants treated with 0.5 mM Cu. 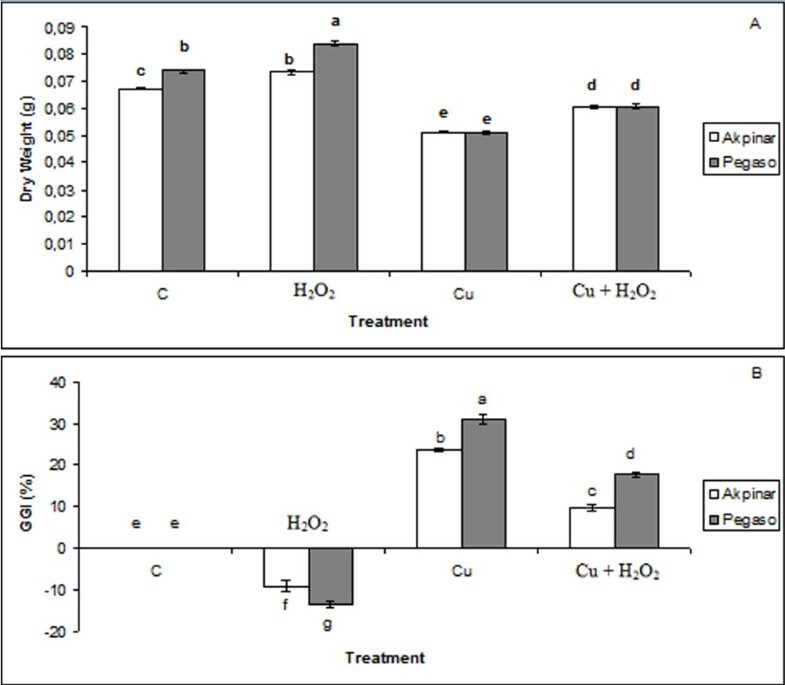 However, the copper-induced growth inhibition decreased when the seedlings were pretreated with H2O2. GGI values were recorded as -9% (negative value represents the increase in growth), 24%, and 10% in H2O2 group, Cu group and Cu + H2O2 group of Akpinar cultivar, respectively. As for Pegaso, the values were found as -14%, 31% and 18% in H2O2 group, Cu group and Cu + H2O2 group, respectively (Figure 3 B). In general, decrease in leaf water potential or RWC in plants is considered as direct indicator of the stress. Ψleaf and RWCs of both maize cultivars statistically decreased in copper stress applied plants compared to control plants. On the contrary, pretreatment of H2O2 (Cu + H2O2 group) prevented the decrease in leaf water potential and RWC values. H2O2 treatment also increased leaf water potential and RWC in both Pegaso and Akpinar cultivars. For instance, while in control plants of Pegaso, Ψleaf was found as -0.84 MPa, the value was -1.27 MPa in copper stress exposed plants. As mentioned, H2O2 treatments increased the values of Ψleaf. The values of Ψleaf were determined as -0.64 MPa and -1.06 MPa in H2O2 treated plants and copper stress plus H2O2 pretreated plants, respectively. Similarly, in control plants of Pegaso cultivar, the value of RWC was measured as 95%. The value was 92.6% under excess copper. However, RWC values were estimated as 97.4% and 93.8%, in H2O2 treated plants and copper stress plus H2O2 pretreated plants, respectively. A similar trend of the Ψleaf and RWC was also recorded in Akpinar cultivar (Figure 4). The effect of H 2 O 2 application on leaf water status under excess copper in maize cultivars. A and B represent relative water content (RWC) and leaf water potential (Ψleaf), respectively. Vertical bars represent standard deviation. Different letters denote significant differences between the two cultivars along with different treatments at p < 0.05. The proline content of the maize cultivars exposed to Cu or/and H2O2 exhibited a specific increase. Exposure to either copper or H2O2 resulted in a rise in proline level of test plants. Interestingly, in unstressed plants, treatment of H2O2 also increased the proline level. The proline accumulation was of the greatest magnitude in copper stress plus H2O2 pretreatment (Cu + H2O2) (Figure 5). The effect of H 2 O 2 application on proline content under excess copper in maize cultivars. Vertical bars represent standard deviation. Different letters denote significant differences between the two cultivars along with different treatments at p < 0.05. The results of Figure 6 showed that soluble protein contents of Pegaso and Akpinar cultivars decreased in plants exposed to excess copper, however, H2O2 applications prevented the decrease in soluble protein content. Moreover, treatment with H2O2 alone increased the protein content in both cultivars. Similarly, protein content increased in the copper stress plus H2O2 pretreatment (Cu + H2O2) compared to control group. The effect of H 2 O 2 application on soluble protein content under excess copper in maize cultivars. Vertical bars represent standard deviation. Different letters denote significant differences between the two cultivars along with different treatments at p < 0.05. The total soluble sugar contents of the control plants were measured as 53 ± 0.004 μg and 79 ± 0.001 μg per g dry weight in Akpinar and Pegaso cultivars, respectively. After treatment with H2O2 (H2O2 group), total soluble sugar contents in the leaves were elevated in both cultivars. The Cu exposure (Cu group) also increased the total soluble sugar content significantly in the leaves of maize cultivars compared to the control group. 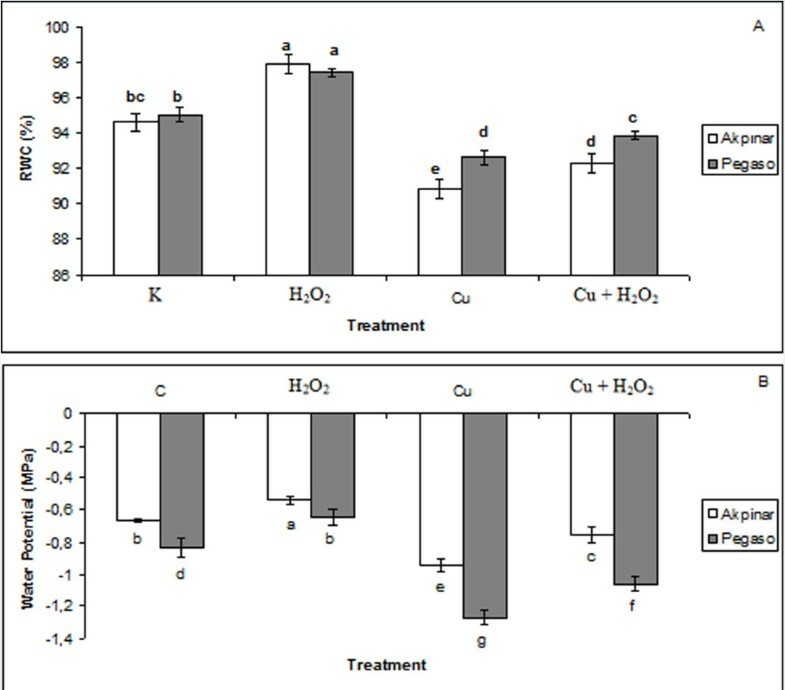 The soluble sugar content showed a higher increase under pretreatment of H2O2 (Cu + H2O2 group) than under Cu stress (Figure 7). The effect of H 2 O 2 application on total soluble sugar under excess copper in maize cultivars. Vertical bars represent standard deviation. Different letters denote significant differences between the two cultivars along with different treatments at p < 0.05. In Figure 8 the results for ion concentration of the leaves have been presented, for these elements where significant changes were detected. Ion concentrations (Na+, Ca2+, K+ and Mg2+) of the leaves of maize cultivars showed that the content of these ions was decreased by excess copper (Cu group) but increased by H2O2 treatment (H2O2 group). Mineral ion concentration of the H2O2-treated maize cultivars was the highest. When H2O2 pretreatment was combined with the excess Cu (Cu + H2O2 group), the decrease in the content of these ions was prevented slightly. The effect of H 2 O 2 application on inorganic ions under excess copper in maize cultivars. A: Sodium content, B: Potassium content, C: Calcium content, D: Magnesium content. Vertical bars represent standard deviation. Different letters denote significant differences between the two cultivars along with different treatments at p < 0.05. In recent years, it has been reported that H2O2 pretreatment alleviates the damages of the some abiotic stresses such as salt stress in wheat seedlings (Li et al., 2011), oxidative stress in young pea leaves (Moskova et al., 2009), heat stress in cucumber leaves (Gao et al., 2010), aluminum-induced oxidative stress in wheat seedlings (Xu et al., 2011) and cadmium stress in rice seedlings (Hu et al., 2009). However, the exact mechanism of the protective action of H2O2 application at low concentrations against various stresses especially copper stress is not yet elucidated. In the present study, we investigated whether exogenous H2O2 could protect the growth and water content under excess copper and whether the protective effect was associated with the nutrient concentration and osmotic regulation in the leaf tissues. We determined that treatment of maize cultivars with excess copper resulted in a sharply decrease in dry matter of the leaves but exogenous H2O2 applications improved the amount of dry matter. Similar to our data, Mocquot et al. (1996), reported a significant decrease in root and leaf biomass of 14-days old maize leaves at 10 μM Cu concentration. Khandaker et al. (2012), also recorded that exogenous H2O2 increased photosynthetic rates and dry matter content of the leaves in wax apple under field conditions. Collectively, the dry matter enhancement by exogenous application of H2O2 may be of tremendous agricultural importance especially in copper contaminated area. We also observed that exogenous H2O2 prevented the grade of growth inhibition in maize cultivars under excess copper. Our findings suggested that H2O2 application alleviated the hazardous effect of the copper metals on the plant growth. Accordingly, De Azevedo Neto et al. (2005), observed that salt-induced growth inhibition decreased when the seedlings were pretreated with H2O2. Exposure to heavy metals including Cu is known to deteriorate the plant water balance. The present investigation also showed that pretreatment of H2O2 protected the water content of the maize leaves under copper stress. Similar to our results, Wahid et al. (2007), reported that H2O2 treatment improved leaf water relations of salinity-treated wheat seedlings by turgor maintenance. Liao et al. (2012) also proposed that H2O2 in vase solution of cut flowers reduced the decline in leaf relative water content. In the present study, it was also researched the changes in substances involved in osmotic regulation such as proline, soluble protein, total sugar and some mineral ions. As known, the proteinogenic amino acid proline functions as an osmolyte, radical scavenger, electron sink, stabilizer of macromolecules, and a cell wall component (Aspinall and Paleg, 1981). Proline accumulation as a function of excess metal was observed in Pegaso and Akpinar cultivars. The increased proline content in maize cultivars exposed to copper stress may be associated with the response to water deficit. Indeed, excess Cu-induced accumulation of proline has been recorded in various plants such as Oryza sativa (Chen et al., 2001) and Nicotiana benthamiana (Ku et al., 2012). We also observed that proline accumulation was high in the plants treated with H2O2 in two maize cultivars. Based on its known properties, the increases in H2O2-treated groups may be ascribed in scavenging of free radicals. In copper stress plus H2O2 pretreated plants, the increases in proline content also may be attribute to its a variety of functions e.g. osmo-regulation, redox-regulation and metal chelation. Similar to our data, Yang et al. (2009), recorded that exogenous H2O2 treatment led to a significant accumulation of proline in coleoptiles and radicles of maize seedlings. One of the causes of proline accumulation in plant tissues has been suggested to be hydrolysis of proteins (Aspinall and Paleg, 1981). In the present study, it was actually observed that soluble protein content decreased in the Cu group plants while increasing proline content. Under biotic and abiotic stress factors causing a reduction of growth, protein synthesis is one of the most negatively affected anabolic processes together with photosynthesis, transport of metabolites, and uptake and translocation of mineral ions (Bonjoch and Tamayo, 2003). On the other hand, it is known that copper ions can readily oxidize the thiol bonds present in the proteins, causing disruption of their structure and functions (Mouratao et al., 2009). Similar to our data, Yadav and Mohanpuria (2009), recorded that protein content decreased after exposure to Cu in the young leaves of two Camellia sinensis cultivars. On the other hand, we found that the copper-induced the loss of soluble protein disappeared when the seedlings were pretreated with H2O2 and moreover, the soluble protein content increased in both maize cultivars compared to the control group. The increased protein content could be due to a maintaining of the structure of proteins and/or could be due to an increased protein synthesis. As known, sugar accumulation contributes for regulation of internal osmolarity and protection to the biomolecules and membranes (Sinniah et al., 1998). Effect of copper on the total soluble sugar contents of maize cultivars has been presented in Figure 7. These data indicated that excess copper increased the total soluble sugar content in both cultivars. Likewise, sucrose content, one of soluble sugars, enhanced in the cucumber leaves under copper stress (Alaoui-Sosse et al., 2004). We also observed that H2O2 pretreatment increased the total soluble sugar content in both maize cultivars. In line with these findings, exogenous H2O2 applications might protect the water status of the tissues by providing osmotic regulation. We also researched the changes in ion concentrations involved in osmotic adjustment in two maize cultivars under Cu stress. As known, inorganic ions for osmotic adjustment are mainly sodium, calcium, potassium and chlorine (Chen and Jiang, 2010). Our findings showed that Na+, Ca2+, K+ and Mg2+ concentrations decreased significantly in Cu-stressed maize cultivars. Accordingly, it was reported a highly significant decreases in Na+, Ca2+, K+ and Mg2+ contents under excess copper (Ouzounidou et al., 1998; Alaoui-Sosse et al., 2004). The decline in K+ concentration may have played an important role in the inhibition of the growth. Similarly, Alaoui-Sosse et al. (2004), reported that the decrease in K+ content may have played a crucial role in the inhibition of leaf expansion. In the same way, a decrease of K+ content was observed in rice roots in response to extreme Cu exposure (Chen et al., 2004). As mentioned above, Mg2+ concentration decreased as a response to excess copper in both maize cultivars. The reduction in Mg2+ concentration may be attributed to the decrease in dry matter of the leaves. Indeed, it was reported that decline of Mg2+ concentration could contribute to the reduction in net assimilation rate and to accumulation of assimilates in leaves (Alaoui-Sosse et al., 2004). On the other hand, exogenous H2O2 applications improved the ion concentrations in both cultivars. According to our results, Wahid et al. (2007), reported that H2O2-treated wheat seedlings displayed greater tissue Ca2+ and K+ levels under salt stress. These findings showed that the distribution of the ions could be affected by copper stress but H2O2 applications might maintain the mineral balance under the stress in maize seedlings. Furthermore, the increases in ion concentrations could be concerned to osmoregulation mechanism. Maize cultivars exposed to excess Cu accumulated substantial amounts of Cu in their leaves. Exogenous H2O2 applications also caused the increases in the copper content in both cultivars. The increases make us thinking about that the H2O2 applications may affect the metal uptake proteins. Indeed, in recent years, it has been recorded that sustained low level of H2O2 application to cultured cells lead to up-regulation of the major iron uptake protein and thus induced iron uptake (Andriopoulos et al., 2007). Similar to finding from H2O2 content studies (e.g., 2011), the present study also showed that H2O2 contents increased after each treatment in two maize cultivars. H2O2 is a strong oxidizing agent that injures cells and damages photosynthesis at high concentration when produced internally or applied externally (Wahid et al., 2007). However, H2O2 pretreatment in sublethal doses can exert a protective effect against copper stress by increasing the levels of osmotic solutes such as ion, proline, soluble protein and sugars in maize cultivars. In conclusion, excess copper could inhibit the dry matter production, leaf water content, soluble protein level and mineral ion concentration such as potassium content, an important ion for osmotic regulation, and magnesium content required for photosynthesis, however, pretreatment of H2O2 could alleviate the hazardous effects of the copper stress. The results indicated that increased proline content and higher level of total soluble sugars might also participate in the alleviation of toxic effect of Cu accumulation. In other words, the changes induced by exogenous H2O2 in maize metabolism with osmotic adjustment under Cu stress may be involved in the defense of heavy metal. H2O2 pretreatment might affect the mineral ion distribution including copper in maize seedlings and thus contribute to decreasing of the deleterious effects of copper stress on the growth of maize. The authors sincerely thank Dr. Duygu OZDES for technical support in copper analyzes. SG responsible for growth of the plants, stress applications, sampling, physiological and biochemical analysis and data analysis. RT conceived of the study, designed the experiment, supply all laboratory and chemical substances used in this study and also drafted the manuscript. Both authors read and approved the final manuscript.